2 Who Are Infant Optics? With so many new technologies now available, it is easier now, more than ever, to keep an eye (and ear) on your little one from another room or even from the other end of the house. Using an effective baby monitor like Infant Optics DXR-8, you can stay on top of your parenting game and never miss a beat! Here is the detailed review of a well-known product from infant optics. As a good parent, you always want to make sure your baby is happy, safe and comfortable. Whether you get a sitter or not, monitoring what your child is important if you want peace of mind. This is where the Infant Optics DXR 8 video baby monitor can help. It is reliable, easy to use and truly a high-quality tool that comes at an affordable price. As one of the first monitors in the market to use lenses that are interchangeable, you won’t miss a thing no matter how far away you are from the baby. The concept of infant optics is more like that of the video camera on your laptop. 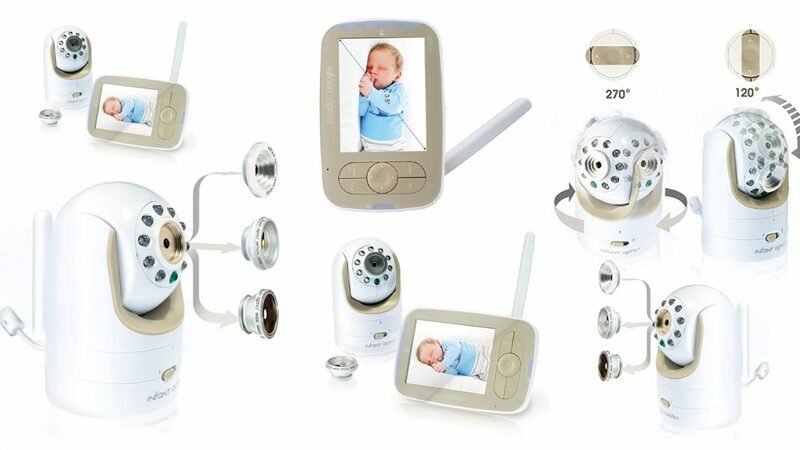 These optical instruments consist of a digital camera that is placed in the same room as your baby. The lens of the camera comes in a high resolution and with different focus points. The camera continuously records the activities of your baby and the video is sent live to you. So, all you need to do is to place that camera near your baby, have the receiver handy and get on with your everyday routine without worrying about the safety of your child. Each time you look at the display in the receiver, you’ll see a live video feed of your baby. Isn’t that great? The best thing about this infant optics is that the range of the device is really good. With the handset in my hands, I can move meters away from my bedroom and the device will still keep on working uninterrupted. Since the camera can focus at various points (far and near), the movements of your baby will be clearly recorded every time. The battery timing of these devices is really good too! Once charged, it can keep on working for up to 12 hours which is another plus. 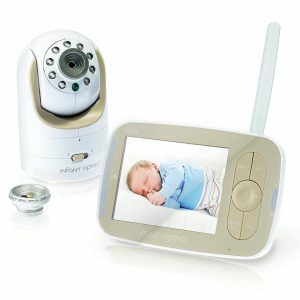 The 3.5″ color LCD screen has crystal clear resolution and an infrared night vision functionality that ensures your baby is visible throughout the night. The monitor comes with a room temperature indicator but that’s not all, it also has a convenient quick-key volume and brightness controls, battery power indicator, low battery warning, out-of-range warning, and alarm system. These indicators and warning messages help you stay on top of things. DXR-8 comes with a sound activated volume control. This means that you’ll get real-time video and sound from your baby’s room, so you can see and hear what your baby is doing. As a high-quality product, the DXR-8 has one major feature, which is the interchangeable optical lens capability. This feature makes the monitor a high-end product because it allows you to set it up for your specific monitoring needs. The monitor features a ‘scan mode’ which goes through all cameras at a 12-second interval, providing continuous video and audio surveillance on multiple camera installations. So, you can install up to four cameras as a single monitoring system. If you have a large area, like a longer, wider playroom, then you can use the wide angle lenses to get a complete view of the entire room as it offers a 170-degree panoramic view. But if you’re concerned about your baby’s sleeping habits, you can use the optical zoom lens to get a close-up look at your sleeping baby. The unit provides complete remote control of the camera. Pan and tilt the camera in any direction you choose and follow your baby without disturbing them. The DXR-8 provides clear, built-in data encryption for added security. No more dropped signals, plus outstanding range and transmission quality. The retractable antenna provides 700 feet range in unobstructed conditions. Infant Optics is a company that believes in keeping children safe while watching them grow. Their goal is to keep Infant Optics products cost-effective so that all parents can upgrade from audio-only monitors to digital video monitors – all done without compromising quality and performance. The good news is – they’ve succeeded in accomplishing this. In 2011 the company started to develop and manufacture different types of baby monitors and since then, have improved their manufacturing techniques and design to incorporate feedback from many customers. This has helped them develop a ground-breaking product – DXR-8 – and continue to improve its reliability and functionality. Infant Optics has become one of the most trusted brands for baby monitoring devices in the US. Unfortunately, there is no warranty on their products. But, you will get protection on labor or defective parts for a full year. Who says you can’t have freedom after having a baby? With Infant Optics DXR-8 baby monitor, it’s easier than ever to keep an eye on your baby wherever you are in the house. With its impressive 700 ft open area reception and 2.4GHz wireless monitor, you can rest easy knowing that you will not miss a single move your little one makes no matter where you are. Go through your day stress-free, knowing exactly what is happening in your nursery. The LCD display of the Infant Optics has amazing color and clarity which makes it easy to find out what your little angel is doing no matter whether the room is dim or well lit and this offers many parents peace of mind. This baby monitor has many impressive features that I can’t stop talking about over and over again. I didn’t expect it to have infrared night vision and this single feature has been a lifesaver. There are no other words to describe this monitor but ‘cost effective’. I have used it for a few months and it works great. If you would like to take some time to do the research on baby monitor market, you will be surprised by how low cost it is compared to other baby monitors with the same functionalities.